Vanity Fair has revealed 4 new magazine covers, each featuring different characters from Avengers: Infinity War in costume as the Russo Brothers continue to tease the release of the hotly anticipated trailer. The stars all got together for the 10th anniversary of the Marvel Cinematic Universe. Inside the magazines are more pictures of the cast with some surprises, so if you're scared of cast spoilers, don't read ahead any further. 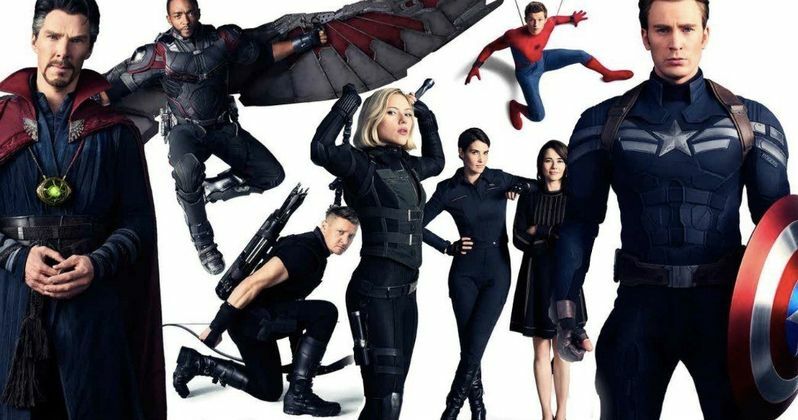 The Vanity Fair covers show off 17 characters spread over 4 covers, Chris Evans as Captain America being one of them in his old school Civil War uniform, and Chris Hemsworth's Thor is shown without his eyepatch. One of the covers features Robert Downey Jr. as Iron Man along with Chris Hemsworth as Thor (no eyepatch, with hammer), Scarlett Johansson as a blonde Black Widow, and Anthony Mackie as Falcon all looking very serious and ready for infinity War. The next cover shows off Chris Evans as Civil War era Captain America with Don Cheadle as War Machine, Paul Bettany as Vision, Evangeline Lilly as The Wasp, and Jeremy Renner as Hawkeye. Scarlett Johansson reveals that she's happy about the future of the MCU, but also a bit sad. She had this to say. "I feel a lot of joy for the next generation. It's a bittersweet feeling, but a positive one." The next cover shows of Chadwick Boseman as Black Panther, Paul Rudd as Ant-Man, Elizabeth Olson as Scarlet Witch, and Mark Ruffalo sporting some green hands as Bruce Banner transitioning into the Hulk. The final cover features Chris Pratt as Star-Lord, Tom Holland hanging upside down as Spider-Man, Benedict Cumberbatch as Dr. Strange, and Gwyneth Paltrow as Pepper Potts. Disney's Bob Eiger tells Vanity Fair that they have the rights to 7,000 characters while noting, "We're looking for worlds that are completely separate, geographically or in time, from the worlds that we've already visited." The Avengers: Infinity War fun doesn't stop at the covers. Inside the magazine we see that Tessa Thompson's Valkyrie will be in the movie as well as some new pictures of Dave Bautista as Drax the Destroyer with a Baby Groot on his shoulders, Michael Douglas as Hank Pimm, Jon Favreau as Happy Hogan, Zoe Saldana as Gamora, Pom Klementieff as Mantis, Sebastian Stan as Winter Soldier along with Stan Lee, Kevin Feige, and Rocket Raccoon. Strangely missing from the spread are Josh Brolin and Karen Gillan. Kevin Feige talked about the unprecedented future of the MCU as well as give some information about Avengers 4. Feige says that there are 20 movies on the "docket" that will be completely new. He explains. "(Marvel is) 22 movies in, and we've got another 20 movies on the docket that are completely different from anything that's come before, intentionally." Feige says Avengers 4 is going to show something that has never been seen in superhero movies. The Marvel head also talked about the "two distinct periods" within the MCU. He had this to say. "Avengers bring things you've never seen in superhero films: a finale. There will be two distinct periods. Everything before Avengers 4 and everything after. I know it will not be in ways people are expecting." This is all very exciting news for Marvel fans as the wait and secrecy have been almost too much to handle for some. To make matters worse (or better), the Russo Brothers have started to tease that the trailer for Avengers: Infinity War could be released as early as this week. While we wait for that mythical trailer, check out the new official images of the cast of Infinity War below, courtesy of Marvel U.K.'s Twitter account.